Adding push ups to your daily exercise routine are an excellent way to increase upper body strength and work on chest muscles. 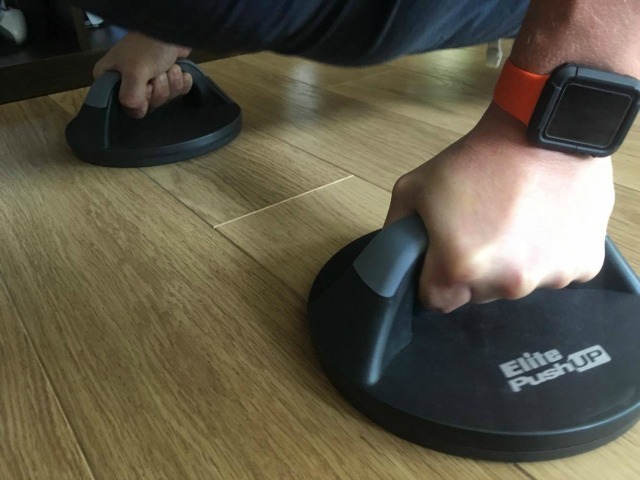 If you want to do lots of push ups (or press ups as they are sometimes called) then getting some push up handles or bars might help to make them more effective as an exercise. In this article I’m looking at why you might want to get them and also the best push up bars around at the moment. 1 How do push up handles and bars work? 2 Why do you need push up bars? 3 What are the best push up bars? How do push up handles and bars work? Push up bars are essentially just handles that you place on the floor and grip on to. You then do a press up as you normally would except that instead of having your hands flat on the floor, you hold on to the bars. You can vary the width at which they are placed and the angle easily and you can also get rotating push up handles too that always keep you in the right position. If you have large gym equipment such as a free standing pull up bar like I reviewed here, you might find that they have some push up bars as part of the equipment and might be worth trying to see if you like to use them. The downside of these is that they are at a fixed position and so you are limited in what you can do. A small set of press up bars would also be good and compact to add some variation to your push up routine. Why do you need push up bars? Regular push ups with your hands on the floor can put a lot of stress on your wrists while they are also in a hyperextension state. This excess strain can cause pain and in some cases injury, so if you’re looking to add push ups in to your routine then avoiding this strain is worthwhile. By using push up bars your wrists are held at a different angle and the pressure is different and so they can ease any potential problems there. Push up bars are also good for varying how you do your push ups by having them at different widths and angles you can focus on different muscles in your arms and chest. And finally they increase your range of motion – you can go much further down with push up bars and so increase the chest exercise. What are the best push up bars? When looking for the best push up handles and bars, go for the best you can. Although they seem like they are a simple bit of kit, you’re putting a lot of pressure on them so a cheap plastic set might end up breaking and causing an injury! Read the reviews on Amazon and go for a good make that has stood up to lots of wear and tear. These are the most budget of my options and are great if you’re looking for a cheap set to add to your home gym. While inexpensive, they are also a good, strong and sturdy option. They are circular in size with a rubber base that grips well to the floor. The handles have a good grip to them and they are really comfortable to use. They are basic but an excellent product. You can check out more reviews of this item on Amazon here. These push up stands by the well known York brand are another good option that is fairly inexpensive. These are made of plastic but are still a sturdy bit of kit. Being plastic they are also lightweight so if you want to take them travelling with you they’ll be better than a set of metal stands. They have a foam handle making them comfortable to use. The only downside for me on these is the shape of them, I prefer the round shape for more stability. 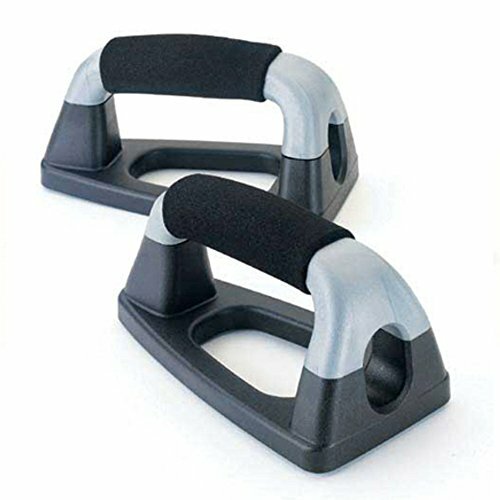 You can see more about this set of push up handles here on Amazon. The only set of metal push up bars in my review are these from Golds Gym. Being metal they are slightly heavier than the plastic versions around, but they are still fairly lightweight. They grip really well to any surface and have comfortable foam padded hand grips. These are an excellent choice and for the price you’ll get an extremely good, well lasting product that will last you quite some years! Check out the latest price and reviews on Amazon here. 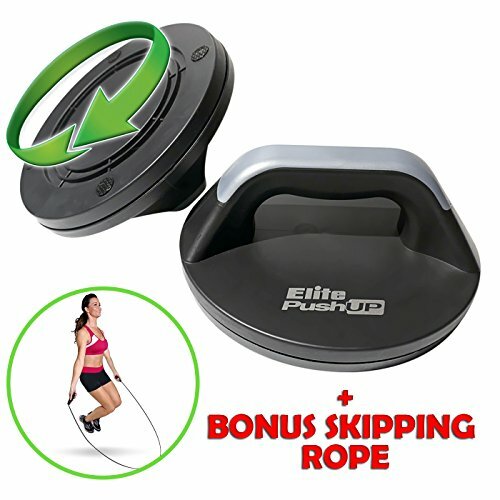 The Elite Perfect Push Up bar is one that is also known as a rotating push up bar. What this means is that it moves slightly as you do your push up so that you’re always using perfect form and not straining in the wrong way. These are round plastic push up bars and have a good comfortable handle. They are sturdy and have a non slip bottom so that you can use them on any surface. This set also comes with a free skipping rope for extra value! You can see more about this set on Amazon here. 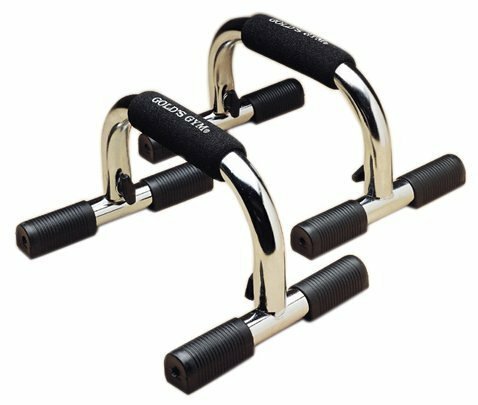 These are also rotating push up bars and are an excellent choice if you’re looking for a well made quality bit of kit and although one of the most expensive in this review, I think are worth the extra for getting a good brand that should last a long time. Again they are circular in shape and these have a ball bearing mechanism which allows it to rotate as you do your push up and so keeping you with perfect form and minimising injury. They have a really firm rubber base to ensure they grip to all surfaces and there’s no worry about them tipping over with the wide circle base. The foam handle is really comfortable too.